TL/DR*: ASUS doesn’t provide their disassemble or technical information to end users. Hello pedro. How may I help you? the AC adapter is now blinking. the AC adapter LED blinks when is connected to the U52F laptop, and it doesn’t blink when is not connected to the laptop. I apologize about this issue your having and I’m more than happy to assist you with this. Would you like an RMA to be created to have the notebook sent in? I am trying to avoidsending it and repair it myself. I can not afford the cost. there is no other thing I can do? it can only be the motherboard? is there somethig to be seen in the motherboard? are there users with the same issue: blinking adapter when switching in? I haven’t heard from you for a few moments. Are you still with me? no report by no one else? I can not find any manual online about my notebook.can you provide one to me? there isn’t? so, how do you do to repair things? I need to repair your product. Can you contact the technicians? So, you mean that I can not get the information about a product that I bought and I own? Is ASUS going to change this any time soon? it looks like a bad idea to help users repair your poducts. That’s what I asked: it is not “they”, it’s you, ASUS. As you can imagine, I don’t care about the different sections in your company, and your problems with information tranfer. Christopher: my computer with all my data is dead. I need to work and you tell me that the info is there, but that you (ASUS, technicians, technical support, whatever) can not provide it. If the only answer you can provide is: “send it to us and we’ll repair it”, you are not understanding what I am saying. Do you want me to start again? I need more information about the ASUS computer I bought, so I can understand the problem and repair it. You (ASUS) have the information, but you are not willing to share it with me. Why can not be passed on? I am your consumer, with your product. So I guess you have very bad policies. That will be my last ASUS product, and I will write about this, although I guess I am not the first consumer who faces this issue. I wish i had more options that i could provide you with i am truly sorry about that. I am sad that companies like yours promote e-waste. Sorry i couldn’t be of more assistance to you, Is there anything else I can help you with? can I file a complain? It is sad how your company not supports repairing. I will also remember this talk. Do you want to say your last word for posterity? Yes, send the manual of the u52f to my email account, once you are out of the office. I will not tell it to anyone! imagine: while having a coffee, do you happen to have the manual of the U52F? imagine contributing in this way to the environment. I know that. I was imaging a different ending to this story. Maybe tonight I will receive that email? Connection lost. Please check your internet connection and then try again. 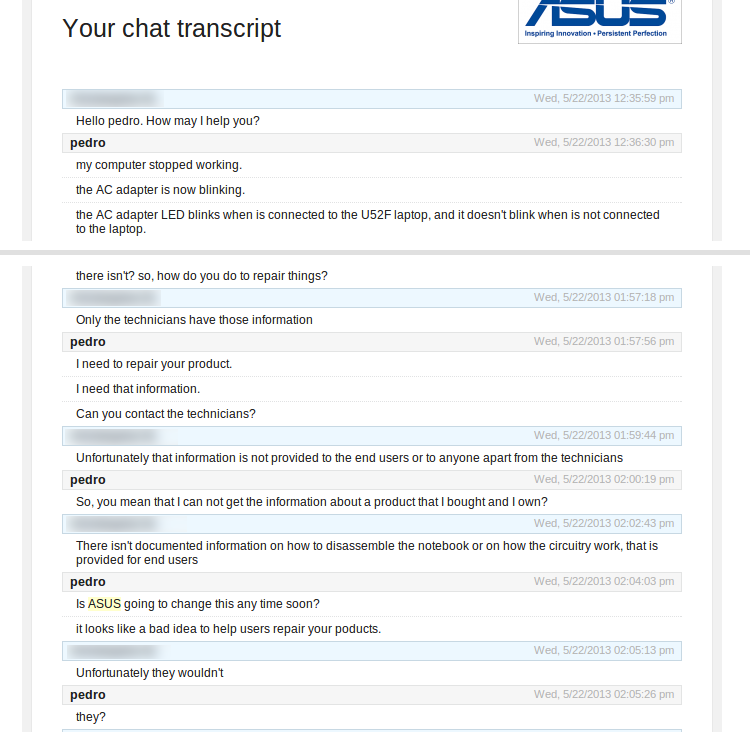 Joseph K. was used instead of the real name of the ASUS support person. The links I sentt, Wired and Tim.id.au, thanks to voragine.net and his text on “distributed logic”.